As Pakistan struggles with a troubled economy, political tensions and fighting between government and extremist forces, about nine-in-ten of its people say they are dissatisfied with the way things are going in their country today. That is up sharply from two years ago. About three-quarters say the nation’s economy is in bad shape and most voice pessimism about the economy in the near term. More than six-in-ten say the economic situation will get worse or stay the same over the next year. Meanwhile, large majorities see their country as plagued by problems such as crime, terrorism, illegal drugs and corruption. The number of Pakistanis saying they are dissatisfied with the way things are going in their country has risen sharply in recent years, to 89% currently. 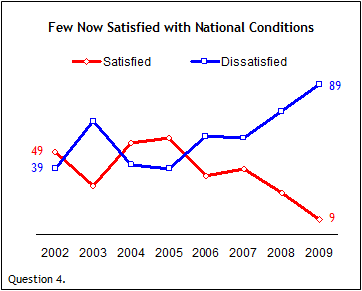 In 2005, just 39% expressed dissatisfaction with national conditions. At that time, a majority (57%) said they were satisfied with the way things were going, compared with just 9% today. Large shares of all demographic groups express dissatisfaction. Members of the two main political parties show almost identical levels of dissatisfaction: 91% among those who belong to the Pakistan Muslim League-Nawaz (PML-N) and 93% among members of the Pakistan Peoples Party (PPP). About three-quarters (74%) of Pakistanis see the nation’s economic situation as bad, and half say conditions are very bad. 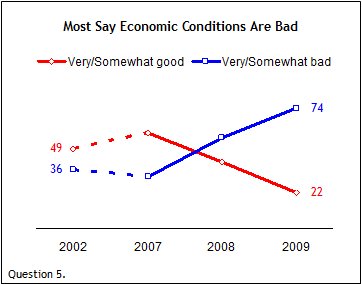 In 2008, 56% said economic conditions were bad, including 35% who said conditions were very bad. In the spring of 2007, a much greater share saw conditions as good (59%) than bad (32%). In Pakistan, there is little expectation that economic circumstances will improve in the next year. 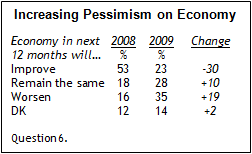 More than six-in-ten (63%) say they expect the economic situation there to worsen (35%) or stay the same (28%). Only about a quarter (23%) say they expect the economy to improve, down 30 percentage points from a year ago, when 53% said they expected the economy to improve. At that time, roughly a third said the economy would either worsen (16%) or stay the same (18%). Regionally, people in the North West Frontier Province (NWFP) are more pessimistic than elsewhere, with nearly six-in-ten (57%) saying they expect conditions to worsen over the next 12 months. In Baluchistan, 38% say they think economic conditions will worsen, as do about a third of those in Sindh (33%) and Punjab (31%). Most Pakistanis see their country facing a long list of serious problems, including crime, terrorism, illegal drugs and corruption. More than nine-in-ten consider crime (93%) and terrorism (91%) to be very big problems. Large majorities already saw both as very big problems in 2007 (85% and 76%, respectively), but concerns have risen significantly. About three-quarters (76%) also say the economy is a very big problem, while a similar share (74%) says the same about illegal drugs and the situation in Kashmir (For more on Kashmir, see Chapter 5). Corruption also troubles Pakistanis: 71% say corrupt political leaders are a very big problem, up from 64% in 2007 and 58% in 2002. Those aligned with the PML-N are especially concerned about corruption – 80% say it is a very big problem in their country – but a majority (57%) of those who identify with President Zardari’s PPP also say corruption is a very big problem in Pakistan. Roughly two-thirds (65%) say pollution is a very big problem, a decline from 72% in 2007. And a smaller share (46%) says that people leaving the country for jobs is a very big problem, down from 53% two years ago. 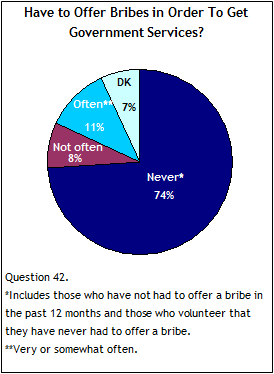 When asked how often in the past year they had to do a favor, give a gift, or pay a bribe to a government official to get services or a document that the government is supposed to provide, a majority (58%) volunteers that they have never had to do it and another 16% say they have not had to do it in the past year. About one-in-ten (11%) say they have had to do so at least somewhat often in the past twelve months, while 8% say they have done it, but not often.